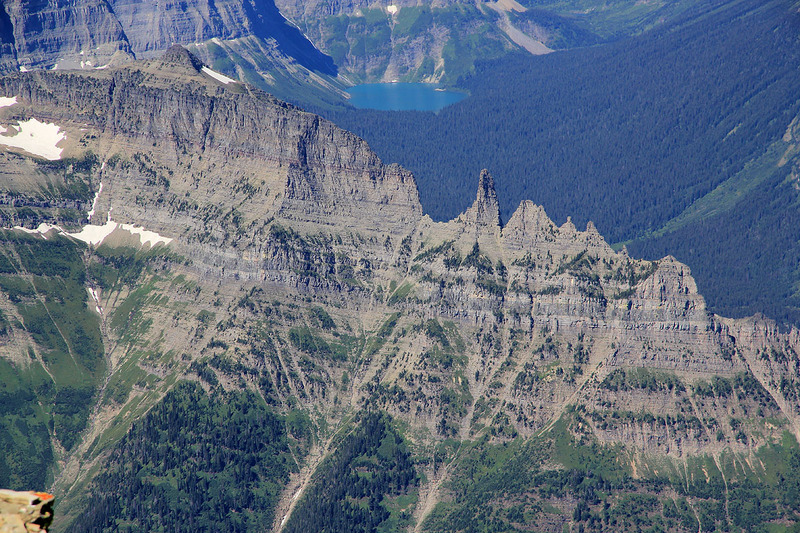 Mount Cleveland is located in Glacier National Park. 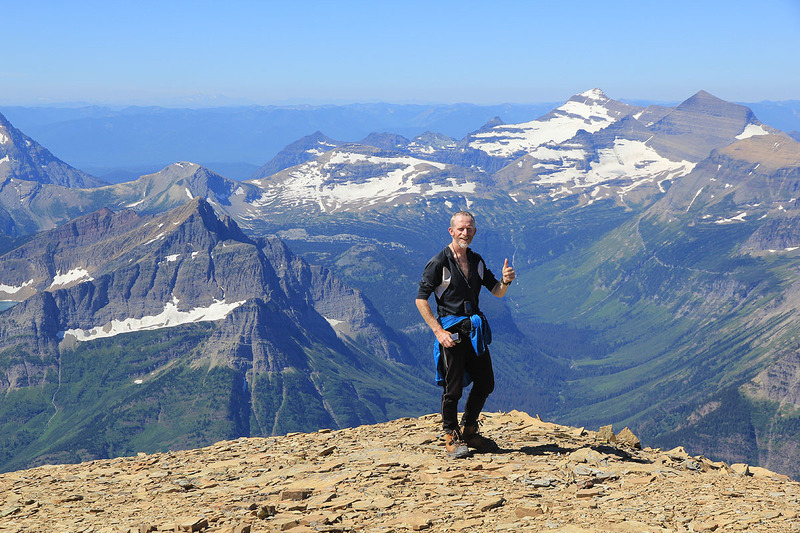 The park authorities are the most unfriendly (and partly incompetent) that I have encountered in any of the more than 20 US National Parks where I have climbed. Their degree of service to parties from overseas is essentially zero, contrast this with the folks at Rainier National Park, who went out of their way to help me climb Rainier already in 2003. 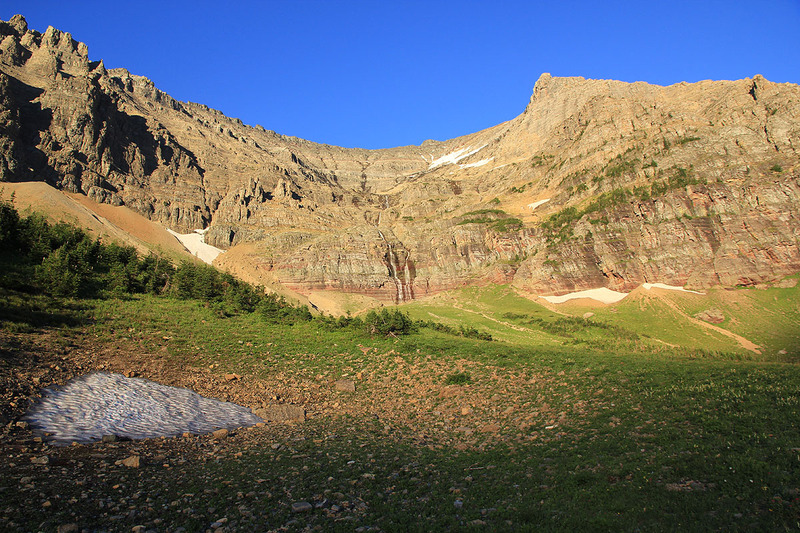 The natural place from where to climb Mount Cleveland, is somewhere near Stony Indian Pass. 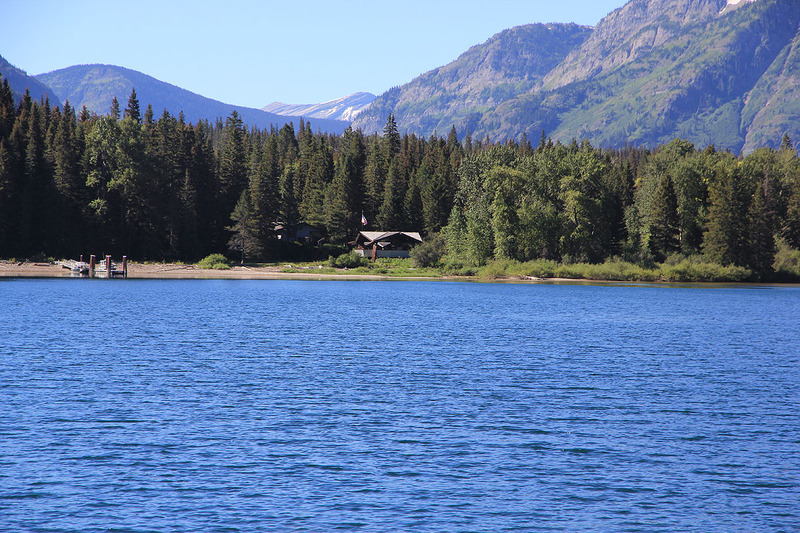 The park authorities run a lottery for securing an extremely limited number of slots (2 slots in 2012) for camping at Stony Indian Lake. This runs in early spring and depends on completely outdated technology like a fax machine etc. They have no WEB interface and they do not want to communicate via email. If you are lucky enough to win (perhaps one chance in thousand?) you still only get one night, while any party typically would like two nights plus a provision to wait out bad weather etc. Anyway, we filed 4 different applications, each asking for 2 different days (as permitted by the rules), altogether 16 possible dates for our stay at Stony Indian. They were all turned down. When I called them (from Norway!) and explained the situation, the ranger informed me that the proper way to climb Mount Cleveland would be via the West Bowl route. He had obviously never been there. 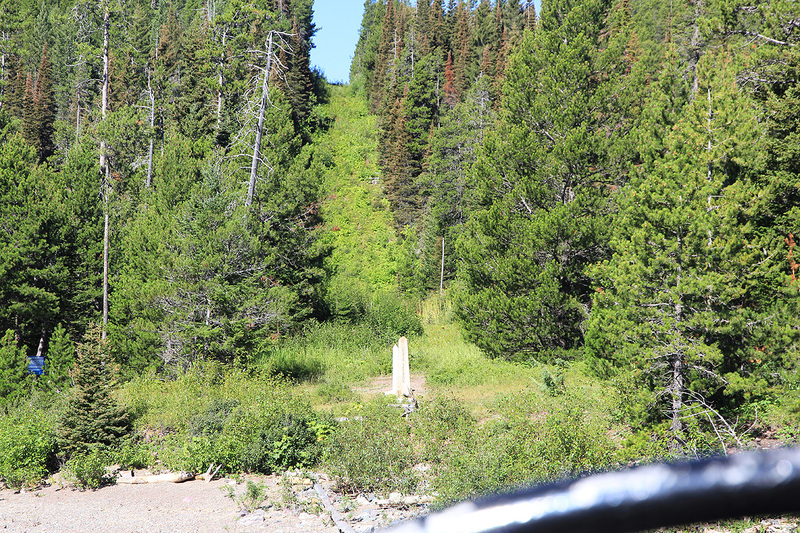 The West Bowl route is a pretty dangerous route, the Park authorities should be extremely cautious about recommending a route with significant objective hazards. I would strongly recommend that the Park authorities change their policy. 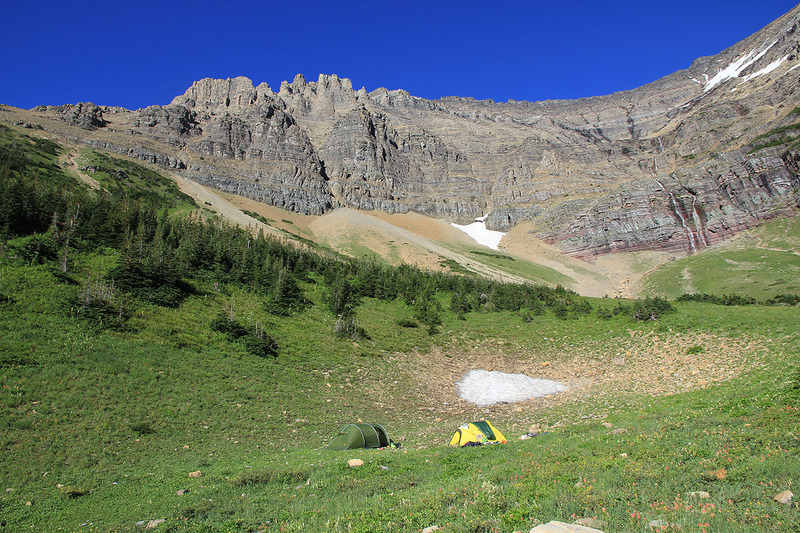 Teams that request to climb Mount Cleveland (this will be a small number) should be given a 3 day wilderness permit with permission to camp, for example near Stony Indian Pass. Such a policy would not change the environmental impact and make everybody happy. 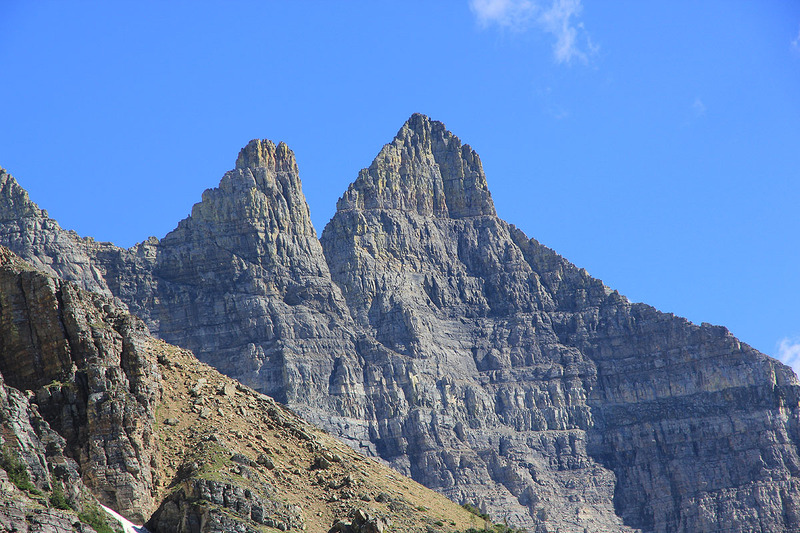 This peak is normally climbed via an approach from the north, in fact from Waterton in Canada. 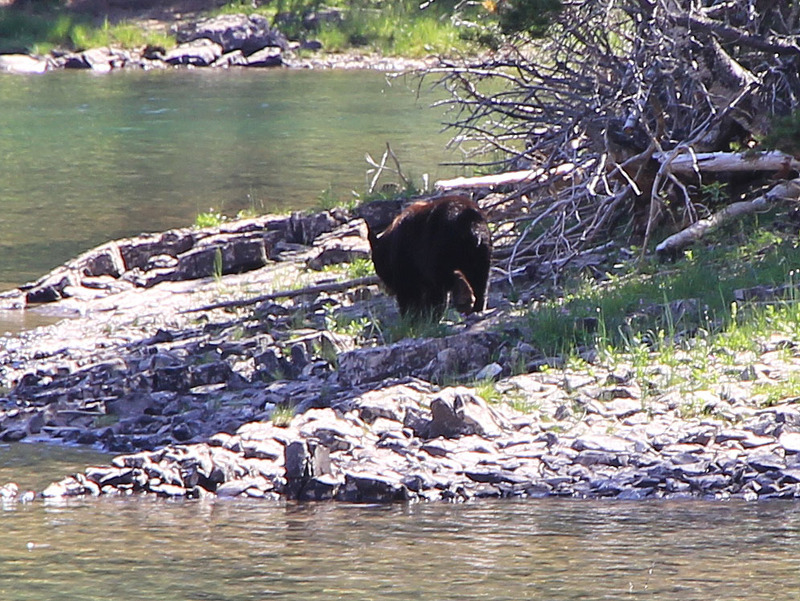 From the US, either from Kalispell, Montana using Hwy. 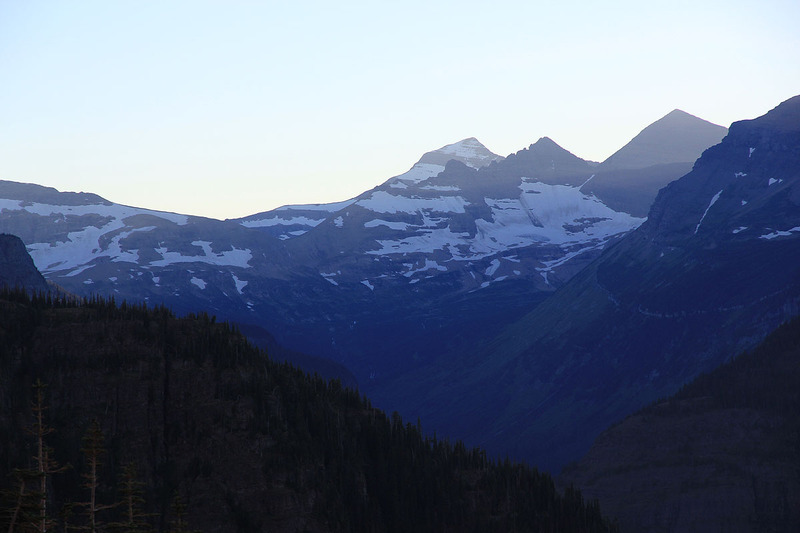 2, then Glacier Route 1, and Going to the Sun Rd. to Hwy. 89, or simply coming from Great Falls, Montana via Hwy. 89. After passing Babb, take Hwy. 17 left and cross into Canada at Chief Mountain Crossing (this border crossing opened at 0700 in the morning), then to Waterton. 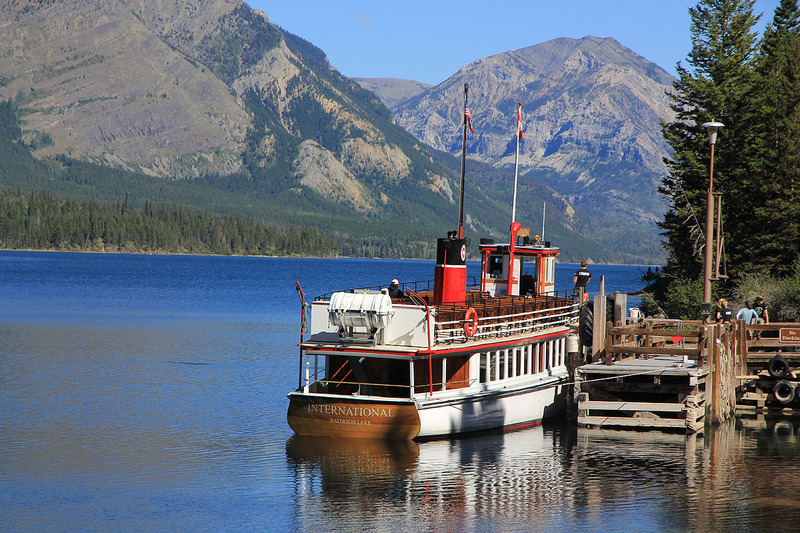 There is a regular boat service on the Waterton Lake, the first departure at 1000 in the morning. There is parking right next to where the boat is leaving. This boat will take you back into the USA and stop at Goat Hunt where you should disembark. You must bring your passport, there is an official US border crossing control at the ranger station Goat Hunt. This location is N48.95950, W113.89041, elevation about 1285 meter. The normal and recommended route (south ridge) will be described here. For an alternative route, see the comments/trip report below. 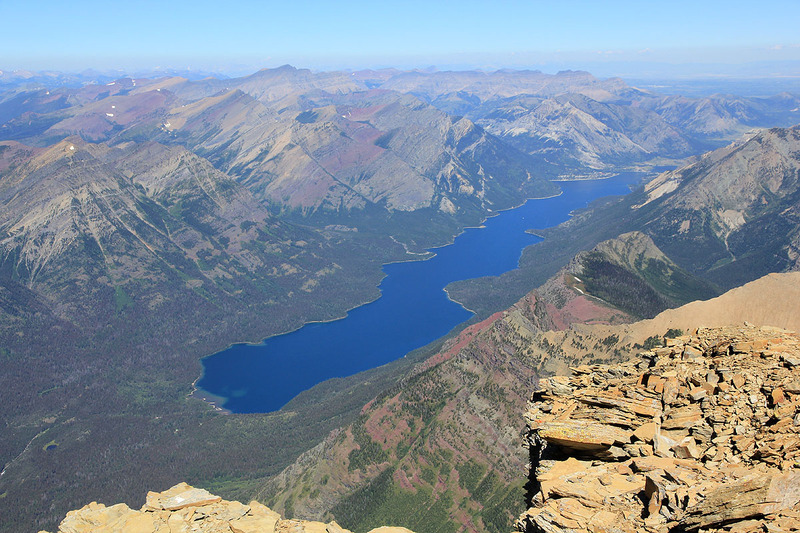 From the south end of the Waterton lake, one follows the trail to Kootenai Lake, then onwards to Stony Indian Lake. This trail is well signposted. 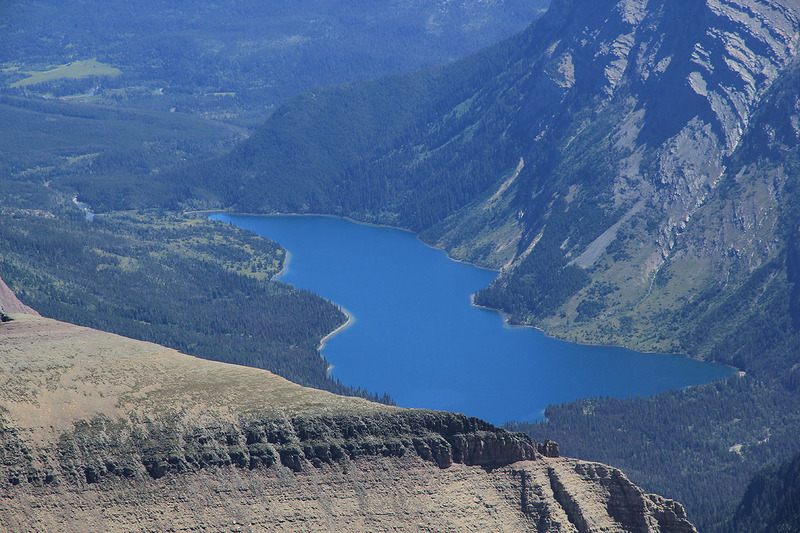 From Stony Indian Lake, continue the trail as it runs by the lake on the left side, then zíg-zags up to Stony Indian Pass. 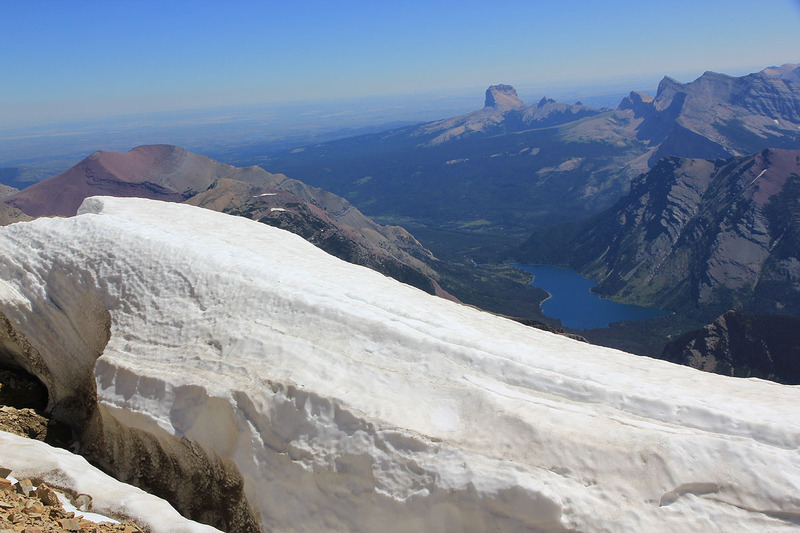 From this pass, try to follow a climbers trail that ascends towards the peak (8848 feet) to the north. 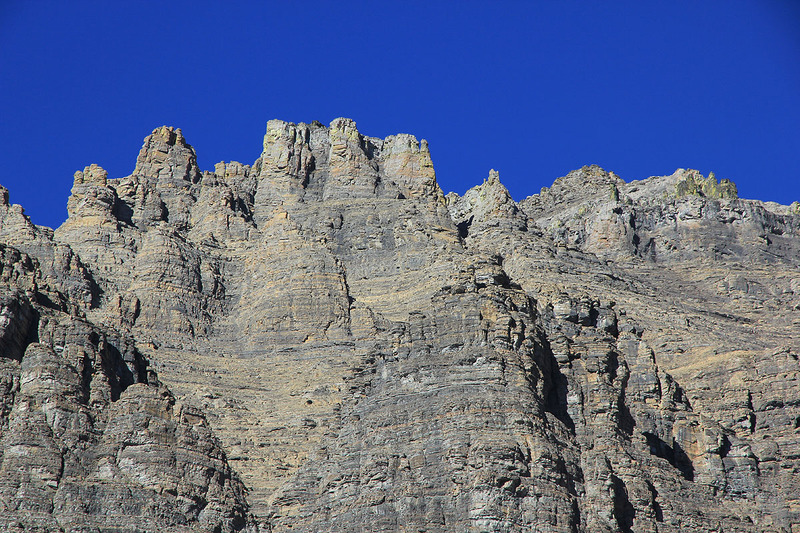 It is easy to loose the route in this area, ascend the south face, staying west (left) if possible. 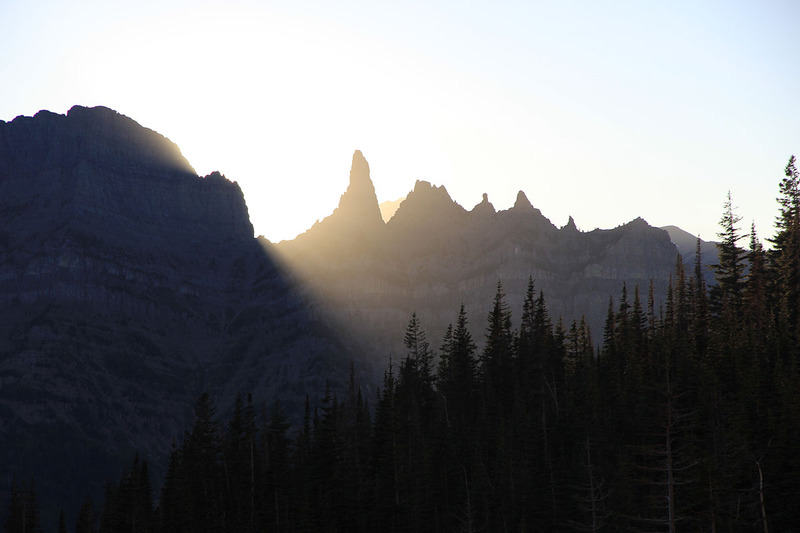 Do not ascend to the top of this peak, the route will make a traverse high on the west side. There are two more or less parallel trails, one higher than the other. 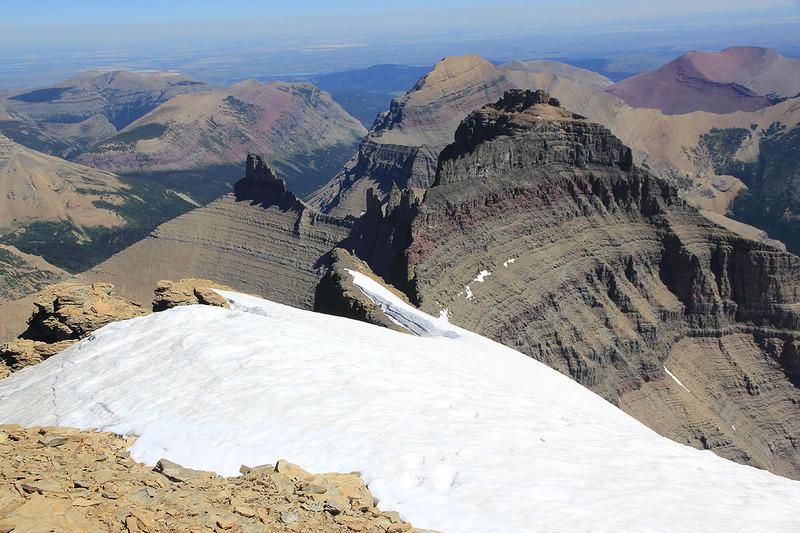 Climb to about 8000 feet, traverse around/across the south-west ridge and follow a climbers trail to the main saddle between point 8848 and the next peak, point 9350. 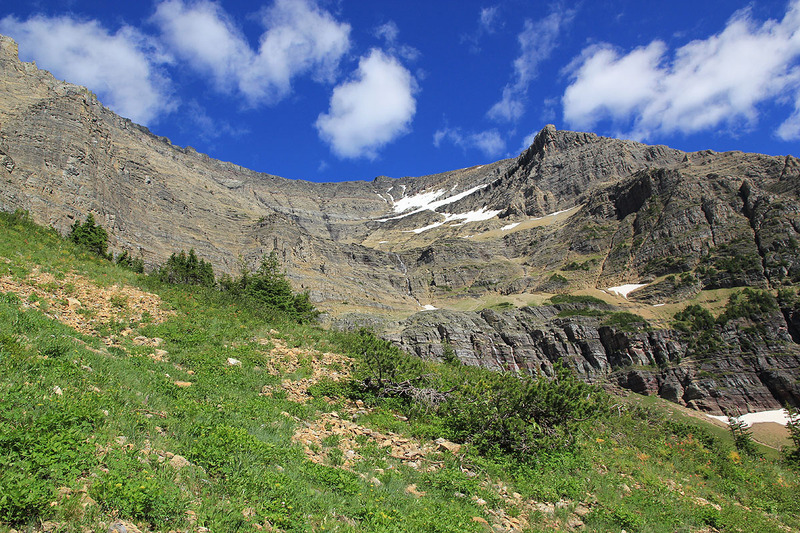 The upper traversing trail connects directly with this col, while the lower variant will climb the uppermost section of an ugly, loose gully in order to reach the col.
From this col, the trail now continues north, but on the east side of peak 9350. The trail runs on a partly narrow ledge, care is needed since there is quite a bit of loose rocks and significant exposure. The traverse continues east of peak 9062 before gaining the crest of the ridge south of Mount Cleveland. The best route now stays on the main crest except for a detour back right (east) in order to circumvent a steeper rock buttress. 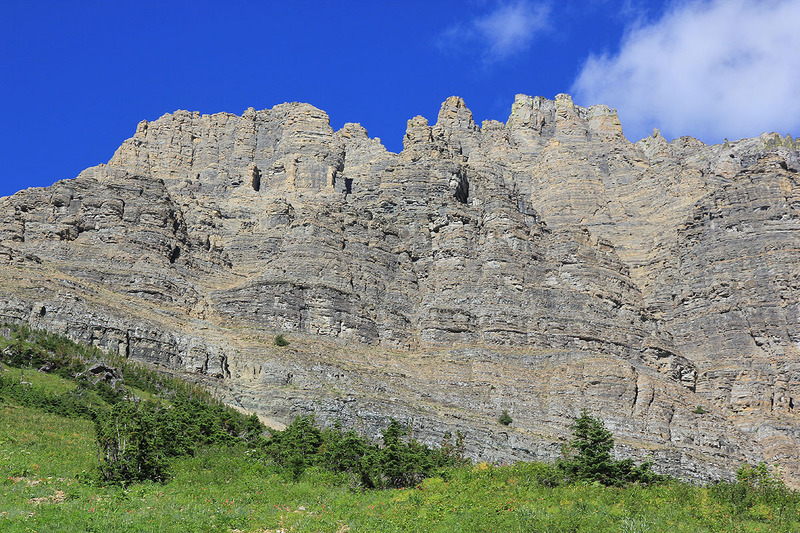 Above this point, the mountain ridge broadens and the slope eases. Continue across a minor south bump before a final slope to the summit. This is a long and exposed traverse, technically easy as long as full attention is kept on loose rocks and the avoidance of any (stupid/careless) mistake. 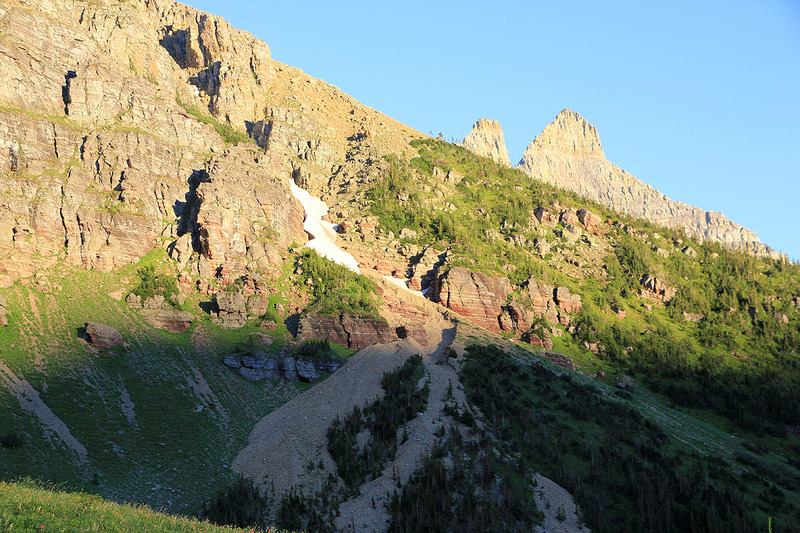 Ideally, this climb should be done with a tent camp near (possibly just east of) Stony Indian Pass. 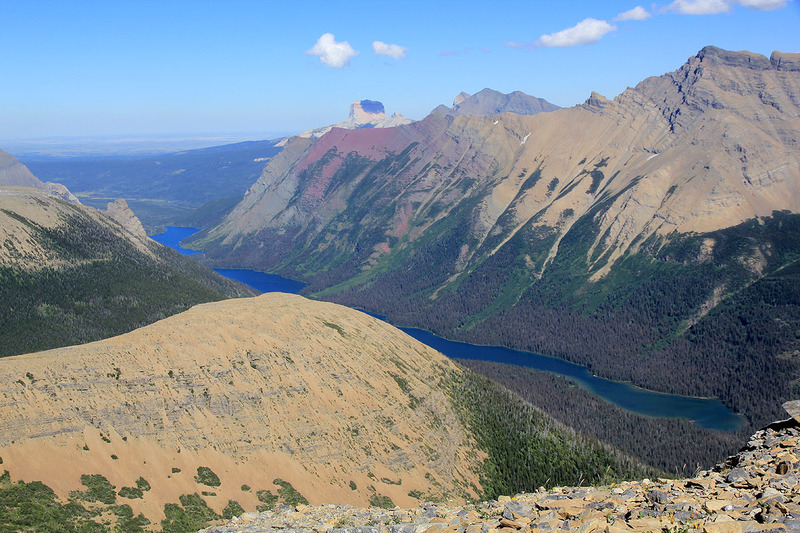 One can then have one day travelling from Canada (Waterton) to camp, one day for the ascent and a return day. 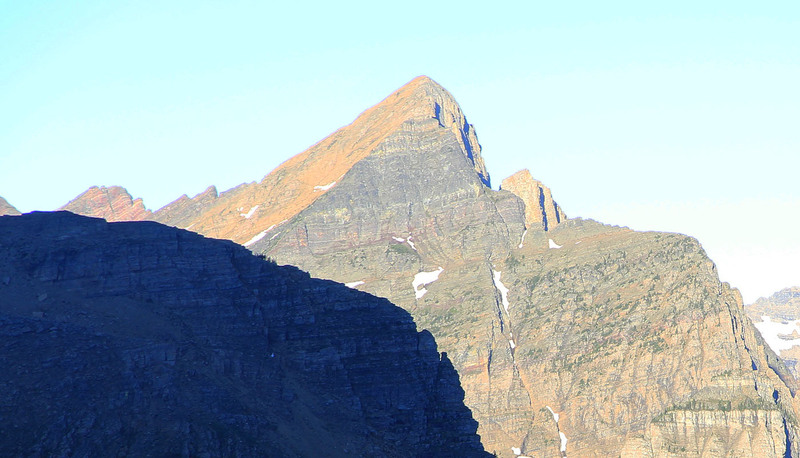 However, the authorities in Glacier National Park makes this close to impossible, see the Red Tape section above. This trip turned out to earn itself the "epic" classification, but this was not easy to guess before much later. I did this trip with Melanie Hetkamp, Eirik Andersen and Rob Woodall. We had a permit for camping in the West Bowl, this was absolutely not what we wanted, but since climbing Mount Cleveland was a high priority, we had to take what we could get. 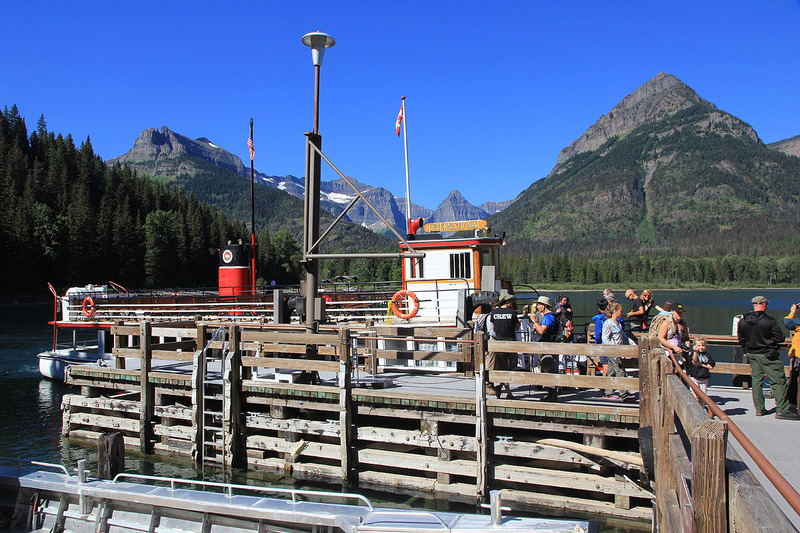 We arrive at Goat Hunt with the boat (photo: Rob) that left Waterton at 1000, checking back into the USA is easy despite the fact that the immigration officer wanted paper copies of our ESTA forms. The internet guidelines says that one does not need to print the form, however these guidelines are likely not thinking about a border crossing without any computer systems! The ranger informs us that so far only a single person has succeeded climbing Mount Cleveland this season. It is Saturday, August 4th., obviously the season for climbing this peak is short. 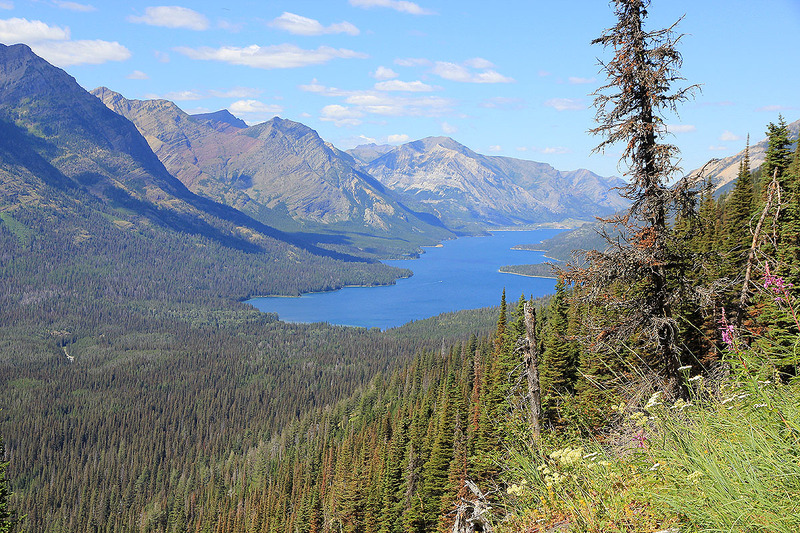 We follow the main trail to Kootenai Lakes for about 3 kilometer, then fork left and aim for the West Bowl. This is the famous bush walk, we were not disappointed! 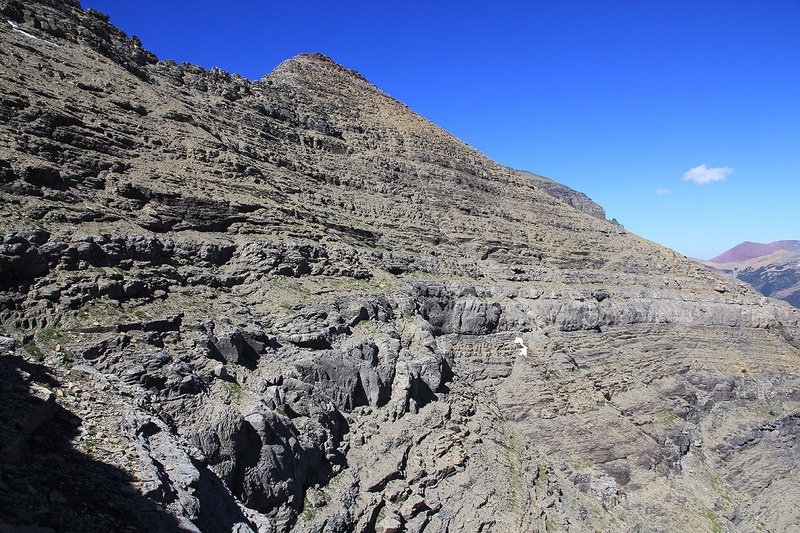 In truth, this is 5-star terrain (photo: Rob) as regards complications and lack of progress! Big fallen trees are everywhere, often across each other, building obstacles that require local climbing. Dense vegetation supplements this, including thorns and plants that have similar sharp features plus possibly leaves that "burns your skin" on contact. 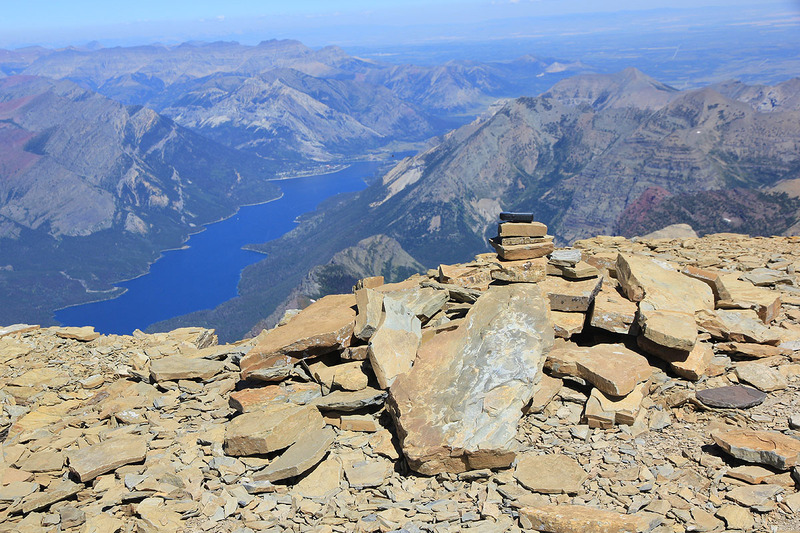 We try to ascend higher and find a clearing from which we can see back down on the Waterton Lake. The smaller trees that grow on the slope are dense and very hard to get through. Better is areas with bigger trees and less vegetation/brush underneath. We make slow progress, but eventually prevail and emerge into the West Bowl after a 6 hour effort. The West Bowl is a very nice area to camp. 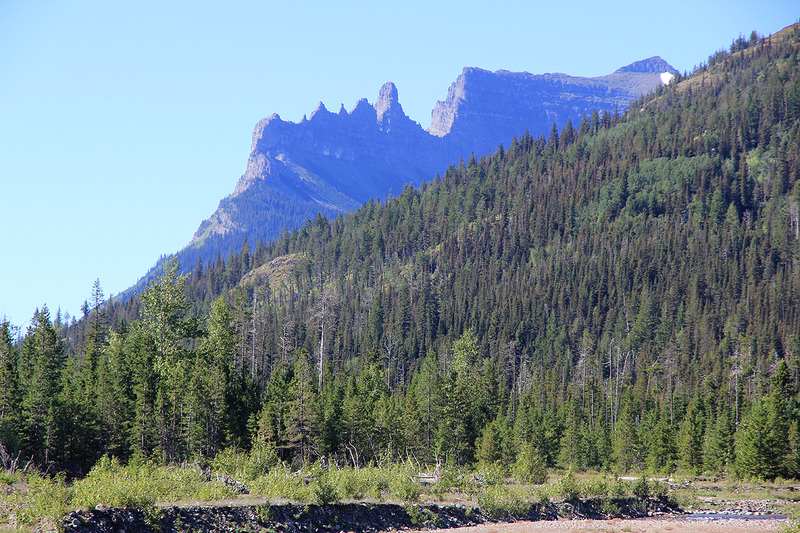 The cliffs of Mount Cleveland towering above us, a nice creek with clean water, and a beautiful view across the valley. 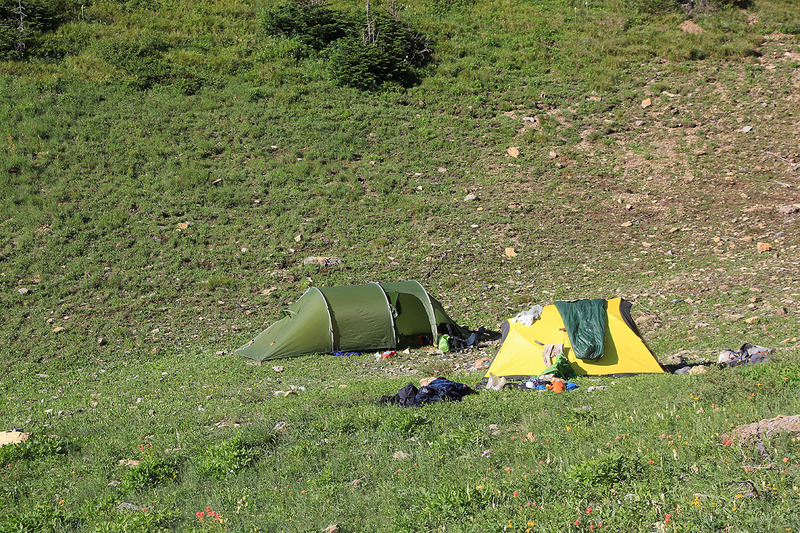 Considering the effort to get here, this is a camp site that few parties get to experience. We relax and cook dinner, preparing for our ascent the next morning. It is very unclear how long this climb will be, we think that it might be possible to catch the last boat back, at 2000, alternatively we should spend a second night here, then hike down and get the morning boat back to Canada. The evening light was nice, the sun actually set temporarily behind the Citadel Spires, then came back out briefly before the light vanished and the day came to an end. The next morning, we were hiking by 0545, about as early as possible if daylight should be of any help. We crossed over right and ascended a big gully with hard snow. We quickly agreed to climb the rocks on its right hand side and gained elevation quite efficiently. 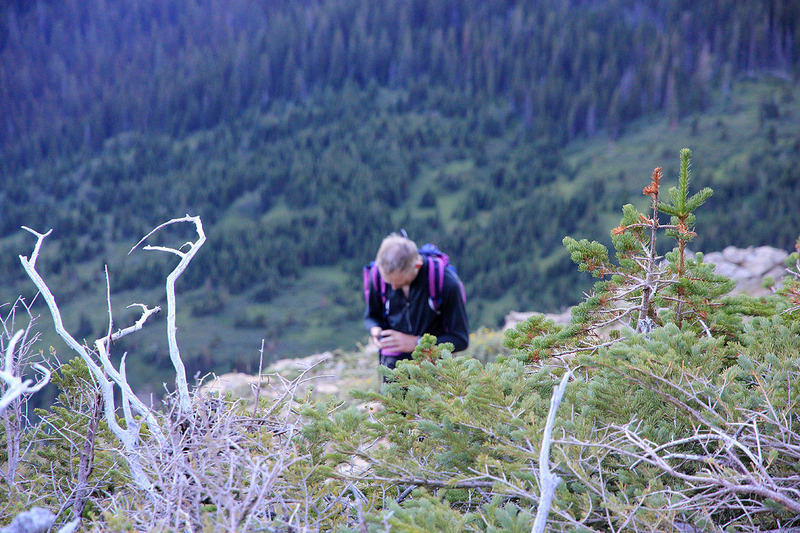 Higher up, we followed a distinct gully with low pine vegetation on either side. This got us higher onto some ledges from where it was clear that we needed to traverse left in order to get properly into the West Bowl. 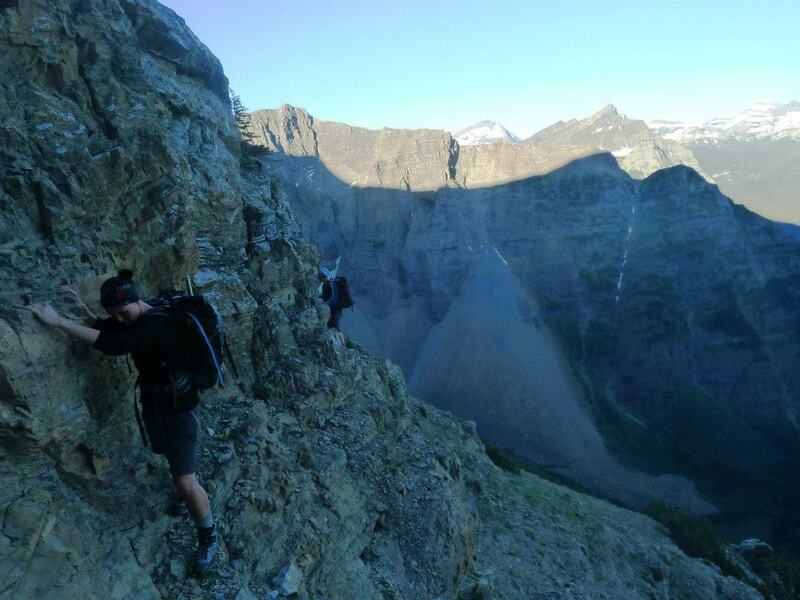 The terrain here was not particulary nice, narrow ledges (photo: Rob) with very loose and bad rock quality. 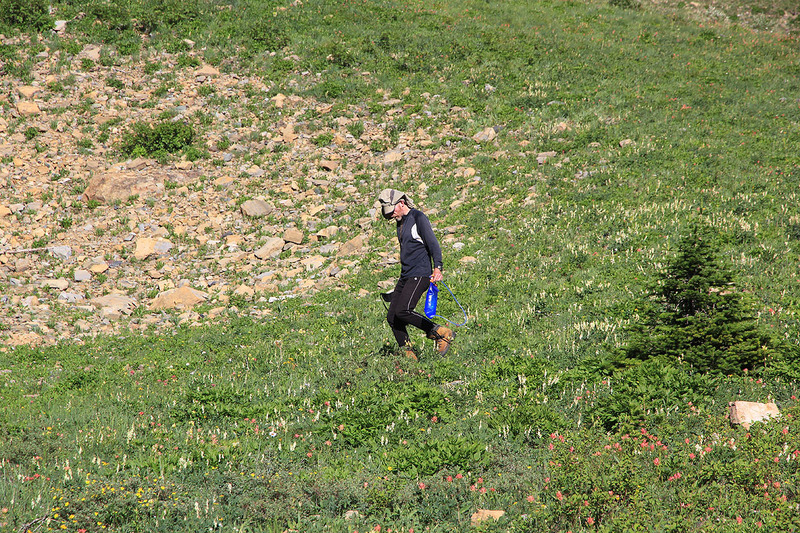 Subsequently, we traversed across a steepish slope of loose, unsatble talus in order to gain a small, local ridge. From here, a descending line following some faint track that likely is an animal track would get us into the West Bowl. Eirik and Melanie were not happy with the poor rock quality and the prospects of many more hours being 4 people in such hazardous terrain. We agreed that they should turn around and hike back down to Goats Hunt, taking the boat back to Waterton, Canada. We would then return separately, either with the boat at 2000, or with the boat the next morning. Rob and I continued, the terrain remained pretty nasty, loose rocks ready to fall everywhere. I tried to make use of the snow, this was actually pretty steep and hard as summer snow often becomes. Crampons on, then off. We did make progress, the rocks looked steeper higher up, but we stayed out of real difficulties. 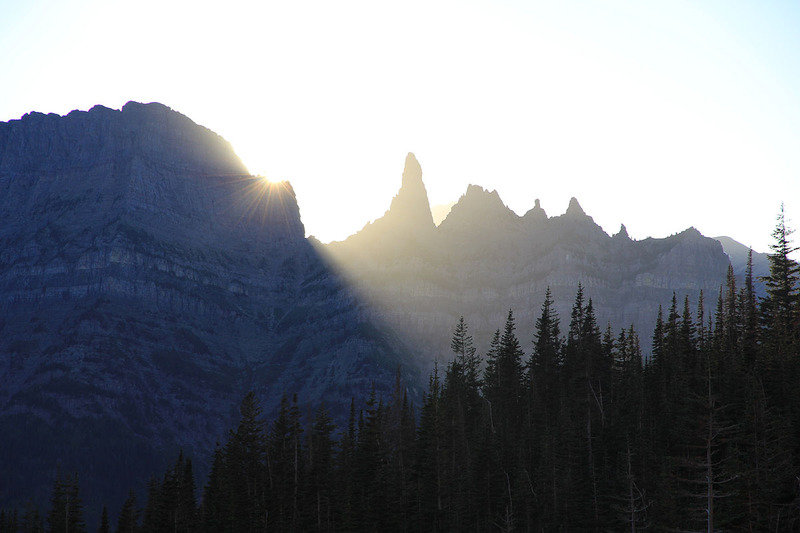 We have been climbing in the shade, but peaks with sunshine comes into view as we ascend higher. 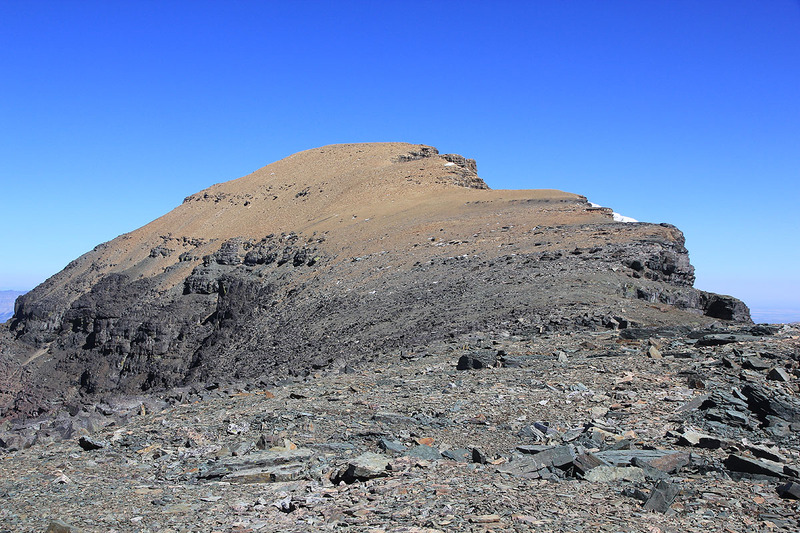 At 1140, we emerge on the main south crest, just near the small hump that connects to the main summit via a shallow col and a slightly more distinct ridge. Thus, the ascent to here has taken us about 6 hours, we do not like the idea of reversing our climb and decide (without any discussion!) to descend via the "normal route", that is along the south ridge. A short break to absorb the scenery is needed, after hours of consentration among loose rock, it is nice to stand on solid ground and look around. We leave our backpacks and take only the camera along for the final 100 vertical meter to the summit. We summit at 1200 - noon and have a well deserved break. The scenery is second to none. 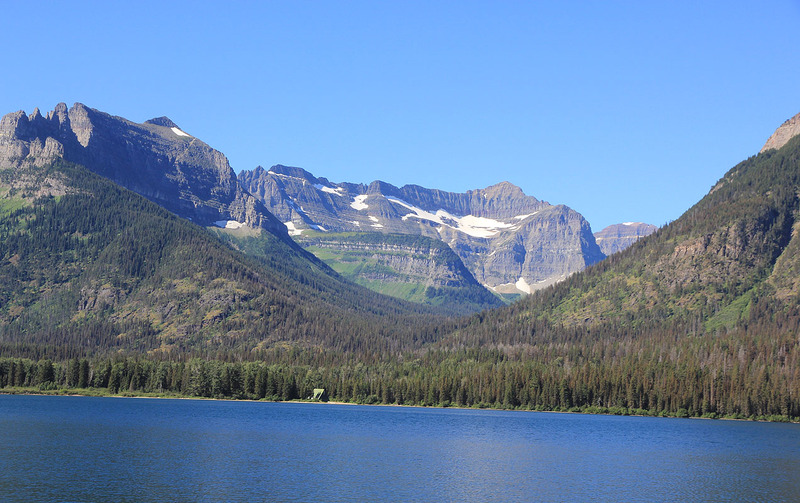 The colors and the peaks in Glacier, combine to create a very unique visual impression. The basic geology of this area creates the layers and the terrible rock, the same processes have made the landscape and the colors so impressive for the eye. I take a complete panorama photo sequence as well as many single shots. The lakes and the landscape to the east are outstanding. We have a very long way to go, so leaving already at 1210, we now start exploring the south ridge route. 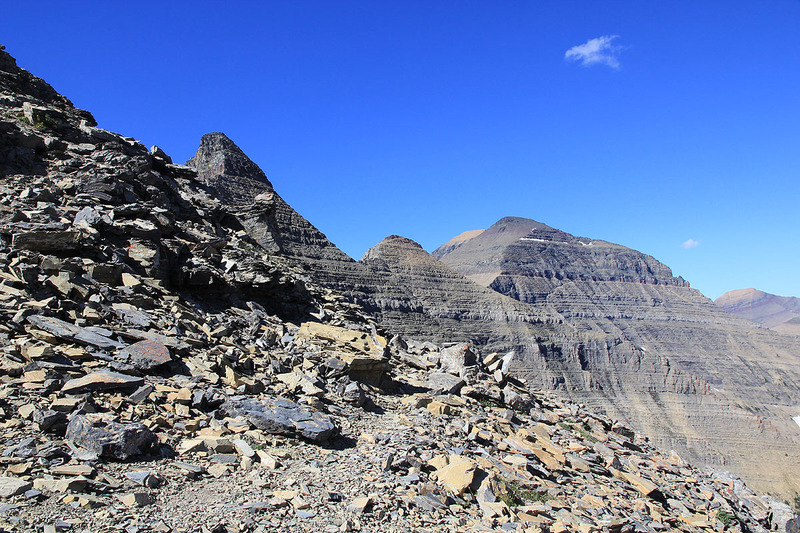 Our descent is uneventful until we reach the main saddle between Mount Cleveland and the next (9062 feet) summit. 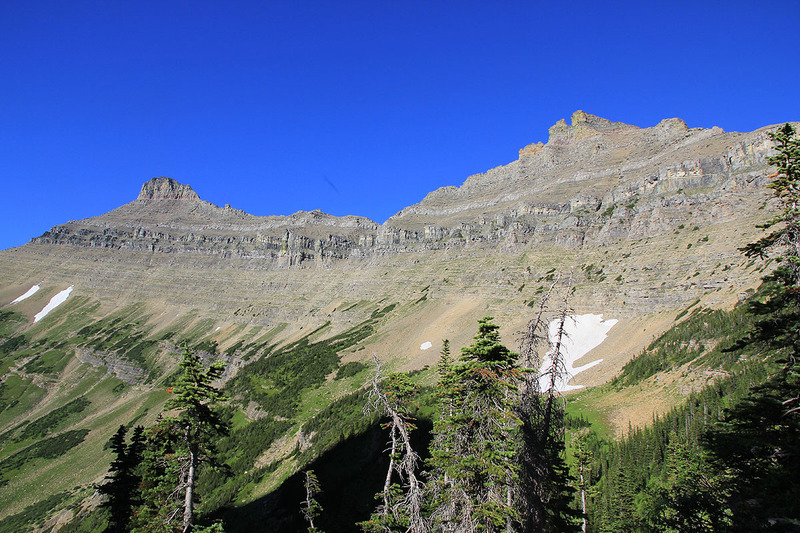 Here, the trail makes a sharp left off the ridge and obviously will connect with a very distinct ledge that traverses on the east (left) side of the next peak. We follow this route until it dead ends at the far corner. Thus, we need to backtrack and reclimb the ridge. This mistake takes at least one hour of extra time. Just as we started a new traverse south, this time higher and without any clear trail, a party of three came in the opposite direction. We exchanged some route information, then continued the traverse (looking back). Nothing difficult anymore, but this (goat) trail requires full attention. A careless stumble here would be fatal. Upon reaching the final col where the route continues its traverse on the west side, we still had more steepish terrain to cover. 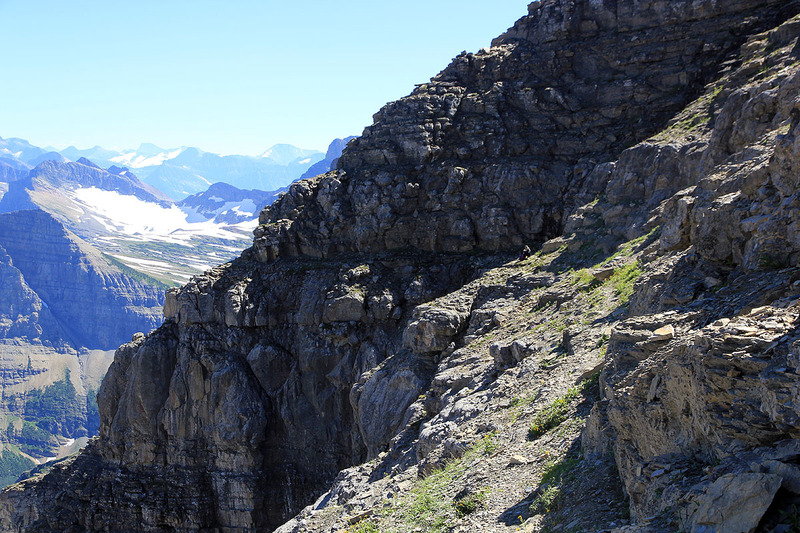 At the very end of the traverse, we lost any signs of a trail/route and descended carefully across and down our final section of unstable talus, steep enough to be dangerous if there were other parties on the mountain. Finally back at Indian Stony Pass by 1800. I realized that Eirik and Melanie would get increasingly alarmed if we were not on the 1125 boat tomorrow from Goat Hunt. This implied that we would need to get there before 1100 tomorrow morning. The bad news being that we had a long trail hike, then the terrible bush walk, in order to retrieve out tent and camp, it appeared that we should work hard to make this deadline. 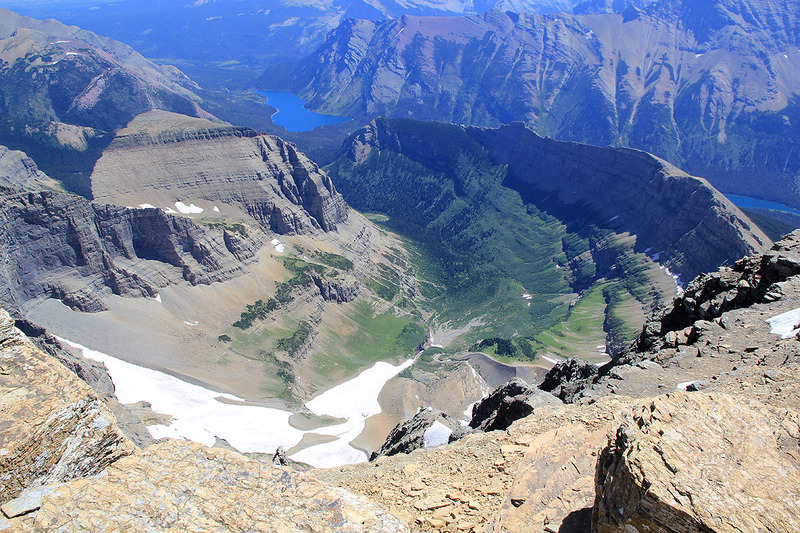 We hiked back down, passing Kootenai Lake before arriving at the spot from where to start our uphill struggle. 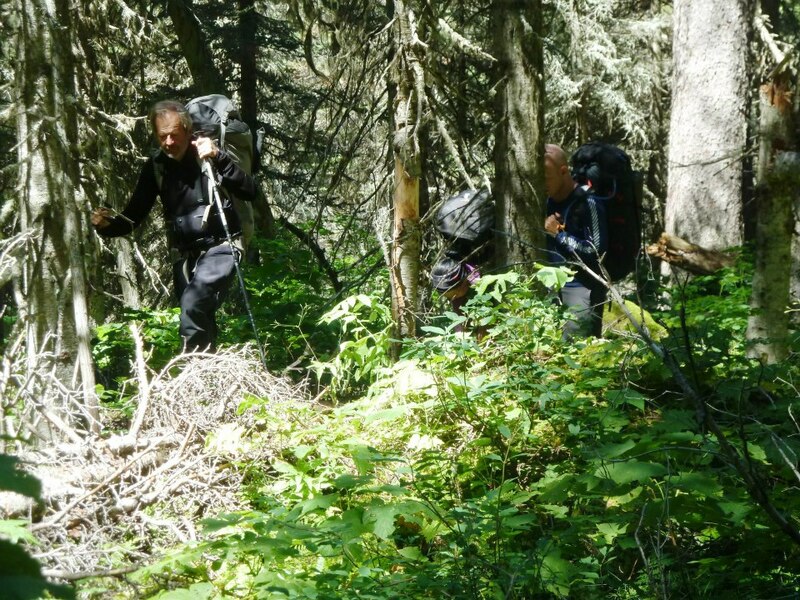 First, we cached almost everything near the main trail in order to minimize weight. It was now 2100 and it would get dark pretty soon. We had a single, small flashlight between us, the other light was up by the tent in the West Bowl. We set out and darkness came. Getting through this horrible terrain in the dark proved exactly as hard as imagined. The light did not guide us outside the most difficult sections, thus we got ourselves repeatedly caught in places where progress completely halted. We used our GPS to indicate progress and at one point, we were only 20 meter closer after 30 minutes of hard work. Eventually, at 0030, I suggested that we should try to catch some brief sleep or at least some kind of rest. We sat/laid down in the middle of a pretty steep slope with some bigger trees and waited. By 0300, the moon was shining. I figured that we needed to move again, if we should have any chance to catch the morning boat. We had taken a lower line and now came to the creek that would branch higher up, its left branch coming from the West Bowl. We climbed along the right side of this upper creek and made our camp in teh West Bowl around 0630, daylight had helped us at the very end of this leg. Including our rest, we spent 9.5 hours from the trail and up to camp. A short break seemed necessary, I had eaten 2 bars of energy food in the last 24 hours. We packed up camp, neither of us looking forward to another struggle from here and back down to the trail. We decided to descend along a line closer to our original (first) ascent, but basically a straight line back down. No need to be clever when the terrain seemed equally bad everywhere. We leave the West Bowl around 0700 and make it back down to our cache in 2.5 hours! Quite happy with our performance, we complete the hike to Goat Hunt in another 50 minutes, arriving well ahead of the boat. A near 29 hour effort had come to an end, both Rob and I felt surprisingly fine, but a nice meal would most likely be a pretty good idea! The boat arrives on time and leaves at 1125, so ample time. 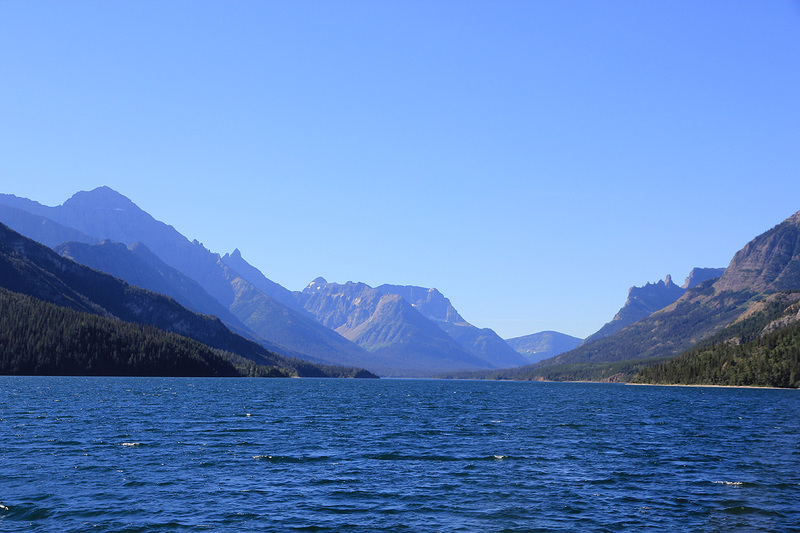 The return cruise on the Waterton lake was as nice as the first trip. 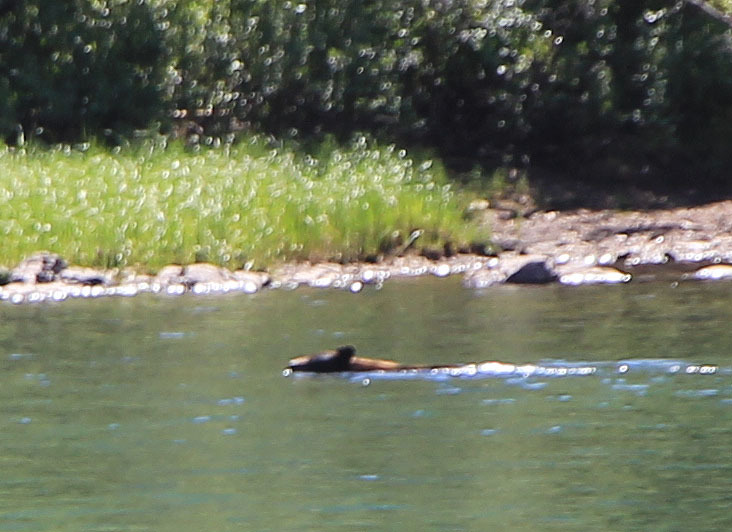 We sighted a black bear on shore and shortly thereafter, this bear even showed off its skills in swimming. 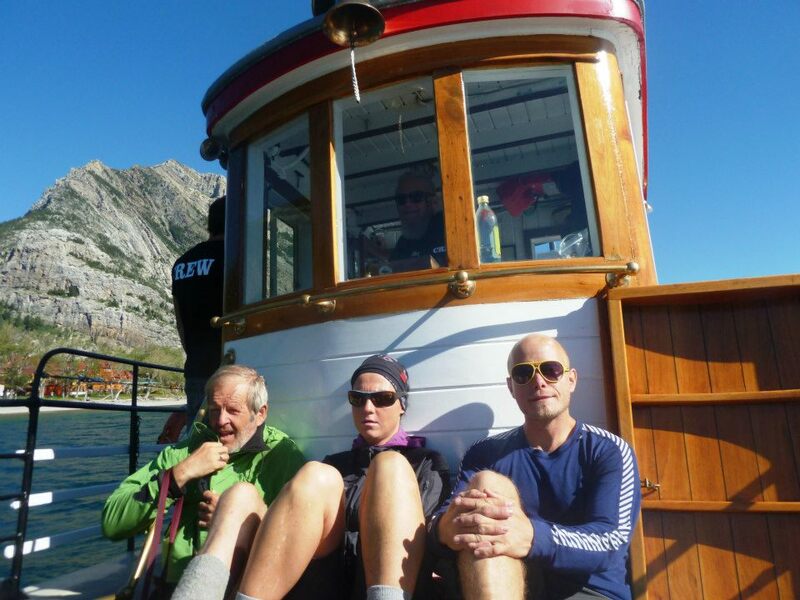 Melanie and Eirik was waiting in Waterton, they had enjoyed the good weather and were happy to see us back. 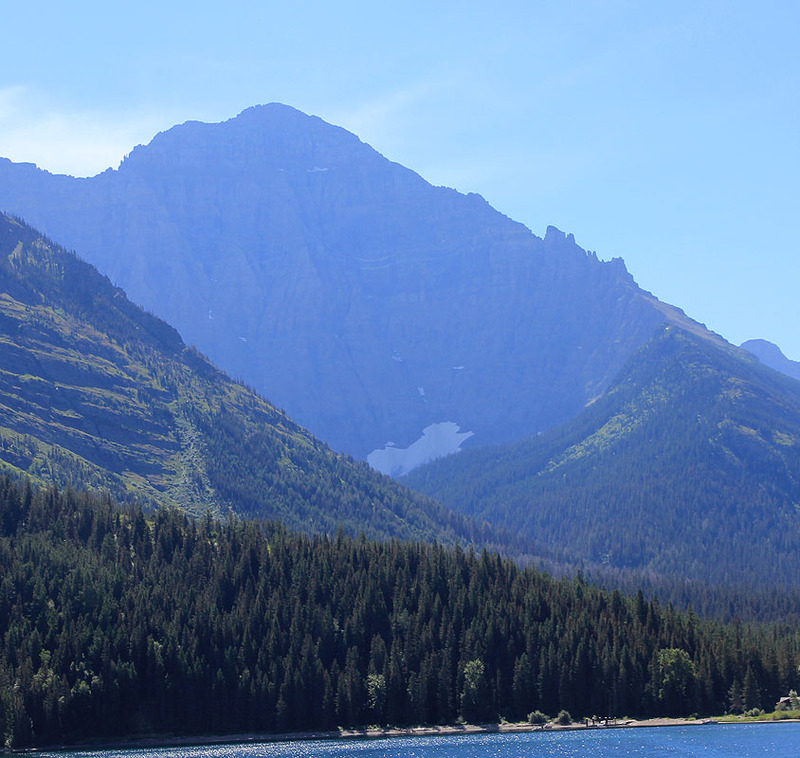 Mount Cleveland, as seen from the Waterton lake. Glacier landscape I, as seen from the boat. 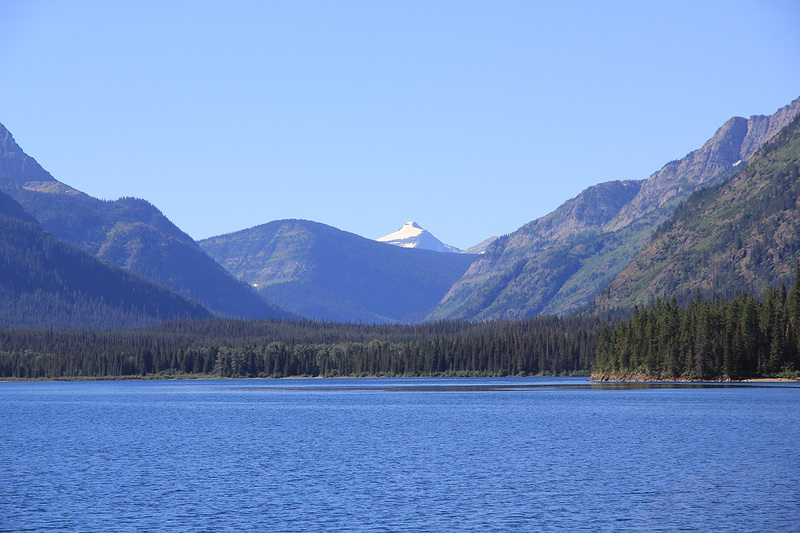 Glacier landscape II, as seen from the boat. Glacier landscape III, as seen from the boat.